With less than nine months remaining before NBC plans to pull its affiliation from Boston’s WHDH-TV (Channel 7), is it any surprise that the fight between NBC parent Comcast and WHDH owner Ed Ansin is now headed to court? On Thursday morning, Ansin’s Sunbeam Television filed a federal lawsuit opposing Comcast’s plans to move its affiliation to a new “NBC Boston” due to launch by the end of 2016. The suit, which seeks $400 million in damages, is based on the premise that Comcast will launch NBC Boston on the Boston-market signal it already owns, Telemundo outlet WNEU (Channel 60) licensed to Merrimack, New Hampshire. 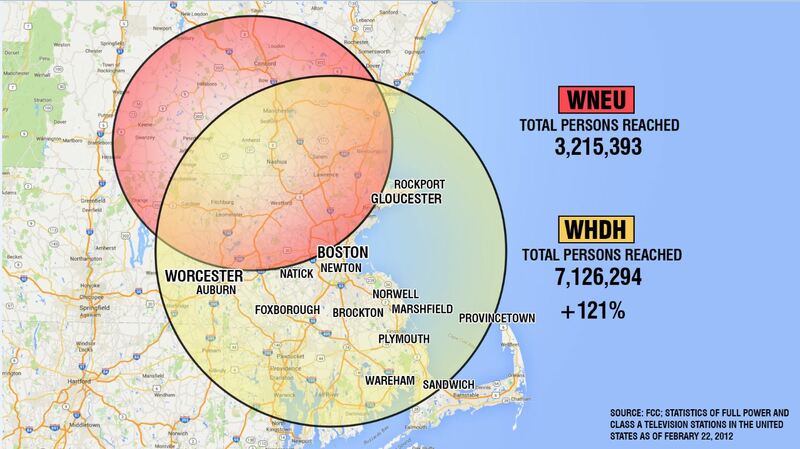 If NBC moves from WHDH to WNEU, Sunbeam argues, it will lose nearly 4 million over-the-air homes from its reach – homes, the lawsuit says, that would then have to turn to subscription services such as Comcast cable TV to be able to watch NBC. And that, the suit argues, violates a promise that Comcast made to the FCC when it was allowed to buy NBC five years ago. Ansin says Comcast assured the government that it wouldn’t do anything to reduce NBC’s over-the-air reach in order to push viewers to its cable business. He points to the areas where WNEU doesn’t reach – lower-income areas like Roxbury and Dorchester – as particular points of concern about the move. Comcast wasted no time firing back, calling the lawsuit “meritless” and noting that its affiliation contract with WHDH was set to expire in December and included a cancellation clause. But what’s more telling, perhaps, is something Comcast has never officially said at all. *In the end, they needed to be with each other more than they needed to be apart. Is there much more to say about the long saga of Howie Carr and WRKO (680 Boston), the Entercom talk station that will have Carr back on its airwaves this afternoon? As we wrote back in November when Carr was days away from leaving WRKO, “there are, in short, no real winners to be found in the next chapter of Mr. Carr vs. Entercom.” And indeed, there were no real winners. Without Carr, WRKO struggled badly to find an afternoon replacement or to get attention for the rest of its checkered schedule. Without WRKO, Carr struggled to be heard over his replacement station, signal-challenged WMEX (1510), or over the patchwork of affiliates his new syndicator cobbled together to replace WRKO’s 50,000 watts. And so just as Rush Limbaugh ended up back on WRKO after Clear Channel’s ill-fated attempt to use his show to launch a new talker, WXKS (1200), a few years ago, Carr will be back in place at 680 on the AM dial today at 3. This time, WRKO will be “just” an affiliate along the Carr network, which should somewhat reduce the tension that’s long simmered between Carr and Entercom management. If the inevitability of Carr’s return to WRKO shows the increasing calcification of the talk format (who, after all, was waiting in the wings to replace Carr? When did the last brand-new talk outlet draw a significant audience? ), it’s even worse news for the other players in this game, especially Carr’s temporary home up the dial at 1510, which is about to go through even more big changes. *Every once in a while, a stunt that looks completely obvious to radio folks ends up catching the attention of the mainstream media, and that’s what happened in NEW YORK‘s state capital when Townsquare flipped WQSH (105.7 Malta) from “Pop Crush” to all-Christmas as “Santa 105.7.” But while Townsquare execs kept a straight face claiming that the market now demanded holiday tunes all year, we all knew better – and indeed, a real format made its debut at 7 AM on Thursday. 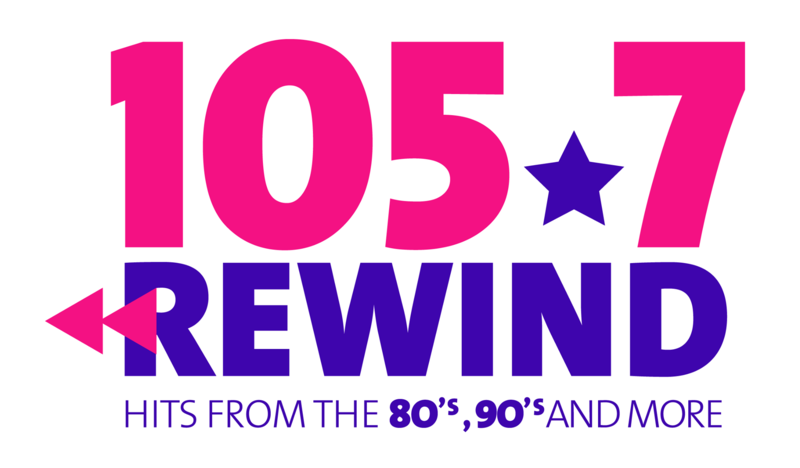 The new “Rewind 105.7” touts itself as “Hits from the 80s, 90s and More,” kicking off with Marky Mark, INXS and Jody Watley. It’s jockless so far except for a morning show (apparently fed from Townsquare in New Jersey), and given the tight niche it’s trying to exploit in a very crowded pop-music market, it may stay that way for a while. *You can’t keep a central PENNSYLVANIA AM signal down, at least not if it’s WHYL (960 Carlisle). After bankruptcy and the loss of its transmitter site, the station made it back to the air March 7 with a new owner (WIOO’s Harold Swidler), a new studio location (Swidler’s North Hanover Street facility) and a new transmitter site (the tower of Swidler’s WCAT-FM 102.3, the original WHYL-FM). The revived WHYL is playing oldies, featuring Kirk Wilson (a former Carlisle mayor) and Larry Flood on the air. *In December 1947, a young man named Danny Stiles celebrated his 24th birthday by buying airtime on WHBI in Newark – and for more than 63 years afterward, Stiles was a fixture on the NEW YORK radio dial, becoming one of the last DJs to spin the old 78s and one of the last living links to the old days of leased-time radio in the city. Stiles went on to spend many years at the old WNJR (1430 Newark), as well as WCTC (1450 New Brunswick), WHOL (1600 Allentown PA), the later 105.9 incarnation of WHBI, WVNJ (620) and then a long run at WEVD in its various incarnations at 1330, 97.9 and eventually 1050. His long radio career (second in New York only to WNYC’s venerable Oscar Brand) came to a close early Friday morning, when Stiles died at the age of 87. In recent years, Stiles had been heard at several spots on the dial: on Saturday nights from 8-10 on WNYC (820), in the spot just before Brand; weeknights in the overnight hours on WPAT (930 Paterson), late at night on WNSW (1430 Newark) and during unsold evening hours on WJDM (1530 Elizabeth NJ) and on Boston’s WRCA (1330 Watertown). 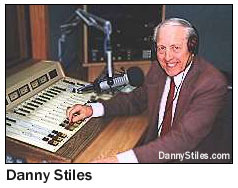 But the “Vicar of Vintage” had also moved into the multimedia world, programming a 24-hour stream of his music at dannystiles.com, which continues at least for now, as do his recorded shows on the Multicultural Broadcasting stations. *We can attach a purchase price to Bill Binnie’s deal for WZMY (Channel 50) in Derry, NEW HAMPSHIRE: he’s paying $9.25 million for the station, about a third of the $28 million Diane Sutter’s Shooting Star Broadcasting paid for what was then WNDS seven years ago. It’s been a pretty quiet year in MAINE’s biggest radio market, but just in time for spring, things are heating up in Portland. On Thursday (March 9), Saga pulled the plug on adult contemporary WMGX (93.1 Portland), reimaging the station as “Coast 93.1” and adding more current tracks to become a hot AC. While Saga launched the station without jocks, most of WMGX’s airstaff will return next week, including the morning show with Tim, Jaime and Eva. NEW JERSEY is already awash in former WCBS-FM personalities, and now two more of them have morning gigs. At Greater Media’s WMGQ (98.3 New Brunswick), Steve O’Brien starts his new morning show today. In addition to CBS-FM, O’Brien’s career has included stops at New York’s WYNY, WPLJ and WABC, WIBG in Philadelphia, WPOP in Hartford and WKNR in Detroit. (He’s also done TV, at New York’s WNYW and WNBC.) Meanwhile, over at “The Breeze” (WWZY 107.1 Long Branch/WBHX 99.7 Tuckerton/WKOE 106.3 Ocean City), Mike Fitzgerald starts today as PD, and he’s doing in mornings as well, joining his former WCBS-FM colleague Joe McCoy, who’s consulting the Press Communications station. Spitzer, who’s the front-runner in the race for governor this fall, has already won high-profile settlements in his payola investigations of several record labels, but Entercom is the first broadcaster he’s directly targeted. The suit offers evidence that top Entercom management, up to and including CEO David Field, pressured local programmers to meet ambitious goals to replace slashed promotional budgets with money provided by record companies or independent promoters, money that Spitzer alleges could only have come from what amounted to the sale of airplay. The case is unlikely ever to see the inside of a courtroom; the conventional wisdom is that Entercom will join the record companies in settling the suit before it can go to trial, especially with the license renewal process underway in New York right now. Spitzer’s likely to file suit against other broadcasters as well, and at some point the FCC could yet get involved as well. You know it’s a slow week when…a format change in Glens Falls, NEW YORK tops the news — and it’s not even much of a surprise. Vox Media did some call-letter swapping a few weeks back, moving the WHTR calls that go with the “Wheels” oldies format from 107.1 in Hudson Falls to 93.5 in Corinth, heretofore a country station under the WZZM-FM calls. When 107.1 then got the calls “WFFG,” speculation ran rampant that the “Froggy” name and country format that’s hopped all over the northeast was about to set down roots in the region. Sure enough, that’s just what Vox did today (March 12), installing “Wheels” on the 93.5 spot (continuing an oldies battle with WCKM-FM 98.5 Lake George) and launching “Froggy 107.” In addition to a better signal, the new dial position sits just below Albany country behemoth WGNA-FM (107.7), which regularly shows well in the Glens Falls ratings. We hear both stations will be doing more live and less off the satellite…ribbit. Another format change long ago given away by the calls: in Watertown, the R&B oldies finally vanished from AM 1410, giving way to sports “ESPN 1410 – The Winner,” matching the WNER calls that replaced WUZZ a few months ago. Also in Watertown, WTOJ (103.1 Carthage) finally gets a license to cover its power increase (to 1800 watts from 870). The mega-opolizing continues in northern New England. Saga Communications has agreed to pay $10 million for Ocean Coast Properties’ WPOR AM-FM. The AM is a 1kw fulltimer on 1490, the FM is a full B on 101.9, and they simulcast country except when the AM breaks away for local sports play-by-play. Saga already owns news-talk WGAN 560, hot talk WZAN 970, classic rock WMGX 93.1, and oldies WYNZ 100.9 in the Portland market, so this deal makes it far and away the dominant owner up there. Only Fuller-Jeffrey comes close, with modern rock WCYY 94.3/WCYI 93.9, AOR (and blowtorch grandfathered-100kw) WBLM 102.9, and pending acquisition of hot AC WZPK 103.7. A few new sets of calls: WBLQ 99.3 on Block Island RI has applied for WERI-FM, to match the calls of new owner Philip Urso’s WERI 1230 in nearby Westerly RI. Urso’s southern-RI holdings now include WERI, WERI-FM, Newport’s WADK 1540 (which is not off the air, despite reports to that effect in one hobby periodical) and WOTB 100.3, and modern-rocker WDGE 99.7 Wakefield-Peace Dale, which is a Providence rimshotter. Meanwhile up in southern Vermont, the WSSH calls that recently vanished from the Boston area have reappeared, on the CP for 101.5 Marlboro VT (formerly WAIG). This station looks like it might actually be on the air soon; it’s applied for a slight power increase as well. A few more station sales: WHOU-FM in Houlton ME, a class A on 100.1, goes from a bankruptcy trustee to local County Communications for $31,500. WHOU had been co-owned with dark WTOX 1450 and WHMX 105.7 Lincoln. And Biddeford, Maine’s WIDE 1400 goes from Witham-Rhodes Communications to Saco Bay Communications group for $80K. Concerning NBC in Boston. Doesn’t NBC own the Channel 48/RF 10 Hanover transmitting from Brockton? If so could they combine that with Channel 60 to fill in south of Boston? Maybe not much RF for the western suburbs, but it may look good on paper.